In August I brought the Peace Belt to a Native American pow-wow in Siletz, Oregon where it was worn by two members of The Confederated Tribes of Siletz. 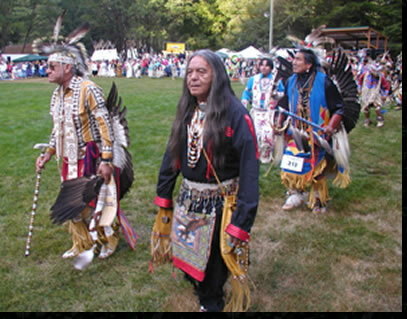 The pow-wow was held among towering trees in a state forest. Camp spots were tucked among the trees, with a dozen teepees in a prime center location. A large open area, about the size of a high school soccer field, became the sacred ground on which the dancers performed, enacted, emoted, and revered their cultural heritage through dance. It seemed like a large family reunion was taking place. People greeted each other warmly and invited one another to campsites to eat and talk for hours. Children met each other and invited other kids into their games as they arrived. An opening parade introduced the tribal elders, veterans of war, and community members of all ages. Geronimo Swift Eagle Warren wore the Peace Belt during this procession. Geronimo is one of the tribal elders and holds a respected place in the community for his cultural practices and knowledge. He travels to represent the tribe and to teach others of the Native ways to which he is accustomed. During another procession, Tiffany Dawn Stuart, Miss Siletz of 2003, wore the Peace Belt before passing her crown on to Miss Siletz 2004. The title of Miss Siletz is given to the young woman who best demonstrates a practice and knowledge of the native customs and values. She then goes on to represent the tribe at functions throughout the year. Drummers, vocalists, and dancers came from throughout the region to represent smaller factions of the tribe. After the opening ceremony, a master of ceremonies presiding over the event from a platform called out to various drumming circles and welcomed different groups into the center to dance. Dancers moved around the space ing a large circle as they danced. The MC called out 'tribal elders,' 'teenaged girls,' or 'young men' among others to welcome groups to the dance area. 'All tribe' meant that anyone could join in, even non-natives. The feeling of community spirit is what remains with me as I think back on the event. As the weekend progressed, I was pleased to notice how many people of varying ethnicities and cultures came to witness and participate in this Native American happening. The interest and welcomed integration of all people seemed to be perfect grounds for the Peace Belt and the values from which it was forged and continues to represent.